Ive tried 3 or 4 products for digestion. Digestzymes work the best for me. 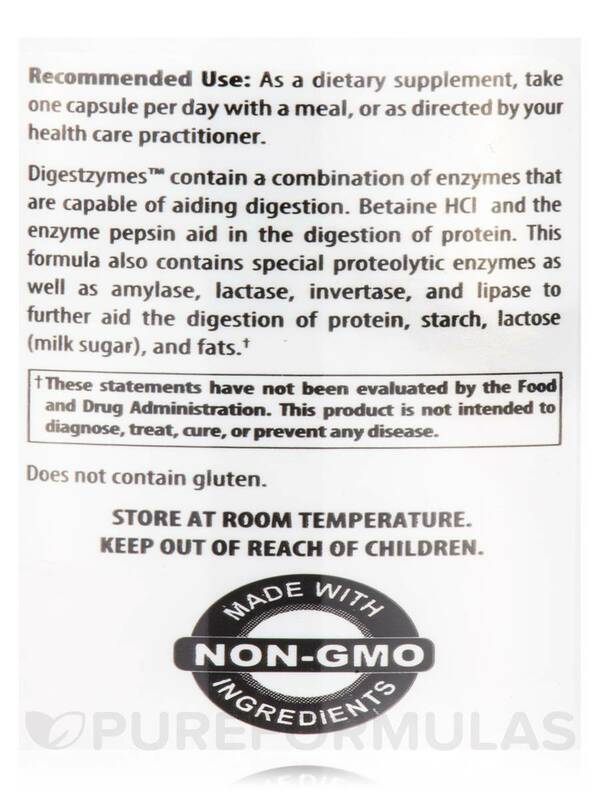 Digestzymes by Designs for Health was recommended by my doctor and tolerate these enzymes well. I have had good luck with Digestzymes by Design for Health. It is a quality product that I know is helping me. If you’re suffering from digestive issues‚ chances are you don’t want to talk about it; it can be painful‚ irritating‚ and just plain embarrassing. 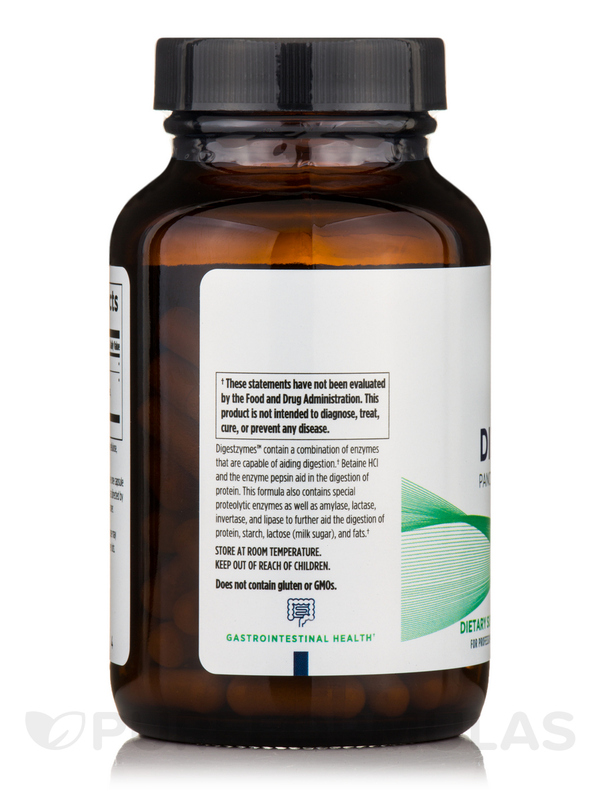 Digestzymes is a full-spectrum pancreatic enzyme supplement specifically formulated to promote digestive health. Insufficient digestion of food can lead to problems like cramping and diarrhea. It can also lead to more severe problems such as high blood pressure‚ plaque in your arteries and much more. For these reasons‚ it’s important to have the right amount of enzymes in your digestive system so your body can digest and absorb the nutrients it needs. 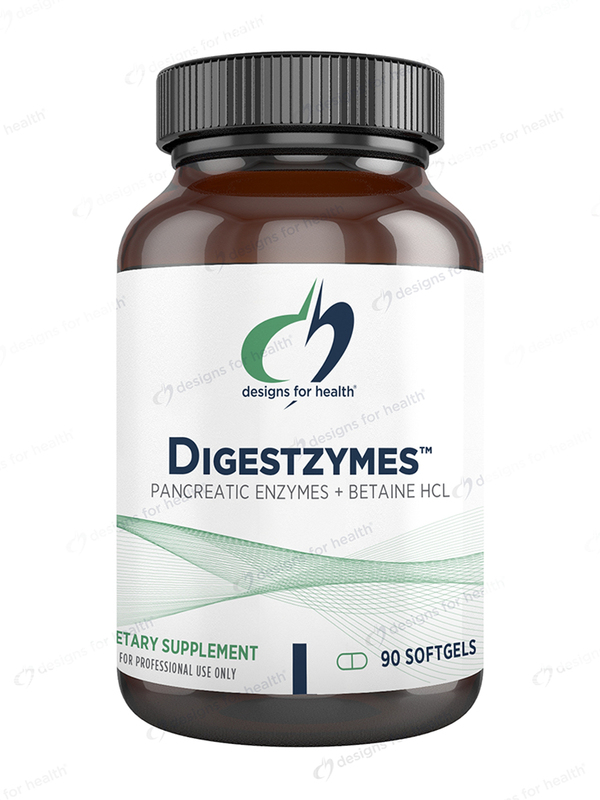 Betaine HCl is the main ingredient in Digestzymes; it’s used as a source of hydrochloride‚ which is used in the stomach to help break down food. If you’re suffering from a shortage of stomach acid‚ betaine HCl may prove helpful. It also aids in the absorption of certain nutrients‚ because your body won’t be able to absorb essential vitamins and minerals without the proper amount of stomach acid. Protease‚ which is an enzyme that breaks down protein. Amylase is another enzyme produced in the pancreas‚ and it helps break down starch. Pepsin is a proteolytic enzyme that breaks down proteins into amino acids for digestion. 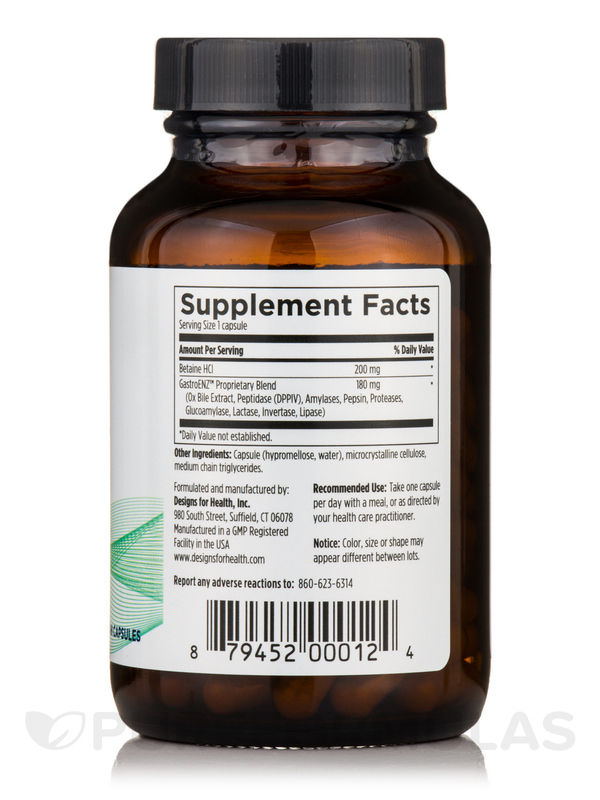 Bile extract is used to help digest and absorb fats. Glucoamylase is yet another enzyme that breaks starch down into glucose‚ so it can then be used by the body for energy. Invertase is used to metabolize and digest sucrose‚ a type of sugar. Diastase breaks down carbohydrates and turns them into sugar. Using Digestzymes before each meal will assist you in preventing gas‚ bloating‚ and constipation. It also helps your body absorb the nutrients from the food you eat‚ which is just as important. 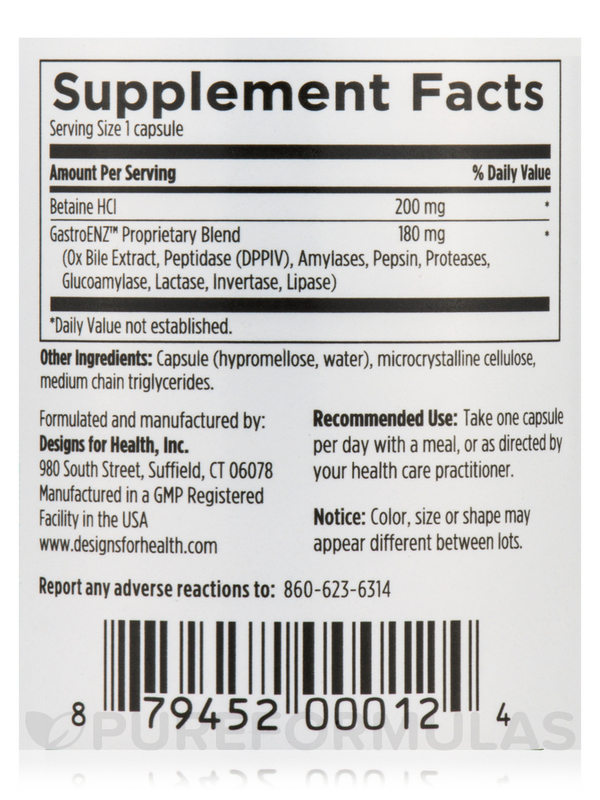 This 90 capsule bottle of Digestzymes should last at least a month‚ depending on how often you use it—it’s ideal if you’re experiencing short-term digestive discomfort. We also offer a 180 capsule bottle for more serious conditions‚ which is more cost-effective and may last several months. I had my gallbladder removed in April and was having digestive issues that were still lingering. Digestzymes by Designs for Health has done a great job to help me digest foods. Also, I like the added enzymes to digest gluten and dairy if I accidentally have them. I am much less bloated and experience less gas when I take Digestzymes by Designs for Health. It really helps with my digestive problems! Digestzymes by Designs for Health is wonderful, no GI upset. Does not upset my stomach. Expensive, but you get what you pay for high quality. 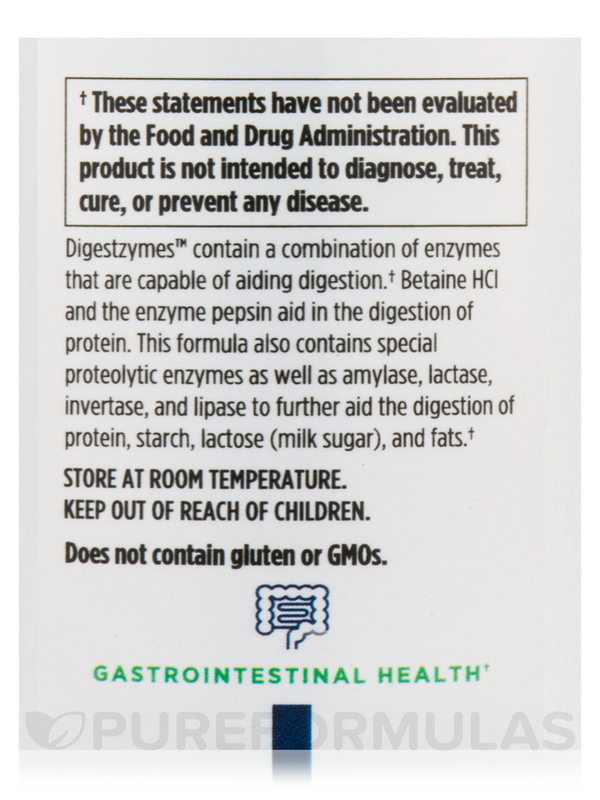 Digestzymes by Designs for Health is the first digestive aid I've taken that actually relieved the bloating I feel whenever I eat. I guess it has enough different enzymes that actually covers the whole spectrum of digestive dysfunction I experience. EXPENSIVE. I go through two of the 180 bottles a month, which is over a hundo just for this one supplement. Only digestive enzyme I can tolerate. I've tried different digestive enzymes to help with low stomach acid, but they all made me very sick. Digestzymes by Designs for Health doesn't have any adverse side affects for me. That it doesn't make me sick! I have been using this product (on and off) for about 3 years. It was recommended by my nutritionist and when she began using another digestive enzyme I didnt like it as well and went back to Digestzymes. It solves gassy problems and seems to help overall. I have recommended it to friends and family and would recommend it highly to those having mild gastric issues. In using this product Ive experienced great relief in my digestive system. Far greater then from any other product made to help relieve Diverticulitis symptoms. Ive turned many people on to this product. Ive even purchased it for them and they had the same reaction I had. I am so grateful my Holistic Caregiver ordered it for me many years ago. I take it everywhere...... It doesnt require refrigeration. Purchasing from PureFormulas is so rewarding. They always have the product its always free shippingand their rewards system is like no other. I forget to take Digestzymes with meals sometimes and then it is revealed how much they do for me. I experience no GI discomfort when I eat one with a meal. I gave Digestzymes 4 rather than 5 stars because I have nothing to compare it to and dont know where it falls in relation to other products.